One of the major differences between our post-industrial diets and the evolutionary and traditional foods of our past is in the kinds of fat we eat. One huge change has to do with the polyunsaturated fatty acids (or PUFAs), which come in several varieties, but most commonly omega 6 and omega 3. PUFAs are “essential fats,” meaning we can’t make them from other types of food, and we must eat them. However, never in the history of humankind have we eaten novel omega 6 fatty acids in such massive quantities. Corn oil, safflower oil, sunflower oil, cottonseed oil, peanut oil and/or soybean oil are ingredients in pretty much all processed food. Just check the list on the back of breakfast cereals, bread and other baked goods, fried items, salad dressings, margarine, mayonnaise, and sauces. Vegetable oils are used (along with canola oil) in the fryers at most restaurants. They are cheap and relatively tasteless, which make them perfect for certain industrial and restaurant food applications. They are also universally high in omega 6 fatty acids, and therefore we eat a ton of them in the Western diet, especially since throwing out butter, lard, and beef tallow 30-40 years ago. Why does it matter if we eat lots of vegetable oil? Omega 6 PUFAs are used by the body to make certain hormones and signaling molecules. Roughly speaking, the omega 6s are the precursors for many of the molecules that make up our body’s inflammatory response. As an example – the omega 6 linoleic acid (corn oil is mostly linoleic acid) is a precursor for many molecules, but among them the prostaglandins that the enzymes COX-1 and COX-2 work on. If you have ever taken ibuprofen or another NSAID painkiller, you have blocked the effects of COX-1 and COX-2, decreasing inflammation and therefore the easing experience of swelling and pain in the body. If you want the nitty gritty details, Wikipedia has a very good and understandable review of these inflammatory signaling molecules. Here’s the real problem – too much inflammation mediated by a high dietary percentage of the omega 6 fatty acid linoleic acid can be reasonably associated with coronary vascular disease, insulin resistance, cancer, hypothyroidism and other autoimmune diseases, thrombotic stroke, headaches, asthma, arthritis, depression, and psychosis. So you can see that such a massive change in our diets in the short term of the past 50-70 years could potentially have equally massive effects on our health. But the omega 6s are only half the picture. It turns out the omega 3s (wild coldwater fish oil is the best source, but it is also available in grass-fed animal fat and other kinds of seafood) compete in the body with the omega 6s. Omega 3s are the precursors for anti-inflammatory signaling molecules (which, obviously, counteract the inflammatory signaling molecules). We can only store so much of either in readily available sites, so if we eat omega 3, we displace some of the omega 6. Supplementing with omega 3 fatty acids has been shown to be beneficial in a number of major diseases. If we max out on the omega 6 without any omega 3, we end up with a highly inflammatory soup of chemicals stored and floating around in our bodies, theoretically predisposing us to that list again – cancer, diabetes, obesity, depression, heart disease, and autoimmune diseases. If we balance the omega 6s and 3s, we end up with a good mix of anti-inflammatory and inflammatory molecules. In the Western diet today, the omega 6:3 ratio is somewhere between 17 and 30 to 1. Hunter-gatherers, coastal fishing populations, and traditional eating patterns have a ratio of between 4:1 and 1:2. So that is the big picture for the whole body – but I’m a psychiatrist. What do the omega 3s do in the brain? The brain has a huge number of cell membranes, and cell membranes are made out of fat. 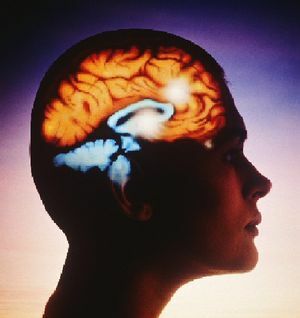 The fat content of the brain is a little different than the rest of the body – the only PUFAs allowed into the healthy brain in any appreciable amount are the omega 3 DHA (a long-chain omega 3 present in fish oil and grass-fed meats) and the omega 6 derived (or obtained directly from animal foods) arachidonic acid (AA). In addition, while AA is found in equal amounts all over the brain, DHA is found predominately in the gray matter. That’s where our thinking takes place. As you can see, the unsaturated bonds break up the structure a bit, and molecular biologists call this “increasing membrane fluidity.” Important cell membrane proteins, such as ion channels, depend on the presence of PUFAs to be incorporated correctly into the membrane. If all is well,the PUFAs serve as part of “lipid rafts” that are required for transport of protein and signals through the membranes, the formation of synapses, and maintaining the integrity of the neuronal membranes. All of these functions are dependent upon DHA and are obviously vital for the tip-top functioning of our complex brains. “[Omega 3 fats] – especially DHA – [are] unique mainly in that they don’t have any real shape. They have so many double bonds that can twist and bend so easily, they change conformation very rapidly and under the slightest pressure fold up into tiny balls or slither out of the way. This is what makes salmon oil so slippery, especially at body temperature. So a DHA-filled membrane is barely a membrane at all. Rather a unique structure. A biological extreme. The membrane equivalent of a soap bubble. They don’t even have a letter in the alphabet for it; even M has only three bends. We can make a bit of DHA from ALA (an omega 3 found in plants, such as flax), but the process is horribly inefficient. Otherwise, DHA is made by photosynthetic algae eaten by krill or fish or oysters, etc. – which we eventually consume. We cannot make DHA ourselves in useful amounts. As we now know, the amount and ratios of PUFAs in our brain are dependent upon what we consume in our diet. What do I conclude from a common-sense analysis of the massive change in our diets coupled with a knowledge of how omega 3s are important for our neurons? Our brains seem to be designed to run on fish oil. We really shouldn’t be operating the all-important noggin too far outside the design specs, or nasty things could happen. All of the clinical research I’ve seen in this area has focused on merely supplementing with extra omega 3 fatty acids, and I will certainly review much of this information in later posts. However, once again common sense will tell us that the best result would likely result from decreasing the overall omega 6 burden while making sure we get adequate omega 3s of the right kind for our brain. In simple terms, that means significantly decreasing the amount of processed food we eat, and making sure we get some oily fish a few times a week. Switching to grass-fed beef and eating lamb or bison (which are usually grass fed) will also help. Olive oil is relatively low in omega 6 (it is primarily a monounsaturated fat and therefore a neutral player in the inflammatory vs. anti-inflammatory war), so olive oil and vinegar or lemon juice can be deliciously substituted for commercial salad dressings. For baking and cooking, use butter, lard (a commenter reminds me it should be naturally sourced and used in moderation, of course), or coconut oil! It won’t kill you. Really. This entry was posted in Health and tagged cottonseed oil, diet, fish oil, food, health, omega 6 fatty acids, our body, polyunsaturated fatty acids by tiptonchiro. Bookmark the permalink.